www.mastersong.de - Michael Holzach "Deutschland umsonst. Zu Fuss und ohne Geld durch ein Wohlstandsland." 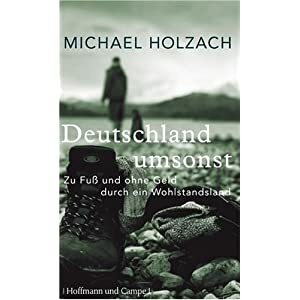 Michael Holzach "Deutschland umsonst. Zu Fuss und ohne Geld durch ein Wohlstandsland." A young journalist packs his backpack, says farewell to his girl and gets himself a dog from the neighboring pet asylum, then walks off Hamburg on his feet. He's commited to walk the country, from North to South, and god only knows when he's going to return. He is further commited to do it without money nor credit cards, just begging for some food for the dog and a place to sleep in the farmers barns. As a temporary Drop out and experienced journalist, he keeps his diary and fills in all those tiny details of such voyage - the friendly as well the unfriendly encounters, the happy walks in the sun as well as the mood swings after a few days walking in the pouring rain. And he's doing well in writing, every page is a joy to the reader. Somehow, this book recalled a lot of my own experiences on the road. Now I know, there is this "Japanese type" of travelling - tabi - in Germany too. And that there is a German saying for "Once on the road, always on the road", too. For the English speakers - sorry, it is available in German only.